We are constantly being told how setting ourselves goals and doing everything we can to reach them is what defines successful people. Bookshelves are full of self-help books and motivational speakers make quite a living from delivering speeches to eager audiences looking for the secrets to “winning”. But what if this obsession with achieving our set objectives isn’t the healthiest or even the most successful way of progressing through life. Often, quitting can be the smarter option. 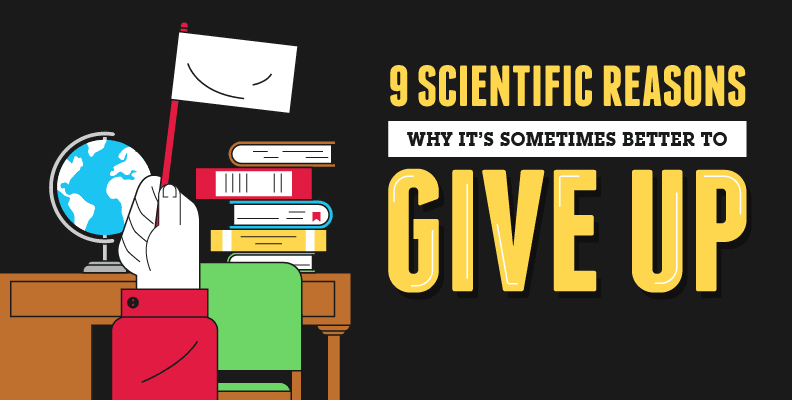 To explore this interesting concept, NetCredit have created this infographic with scientifically backed reasons why letting go is sometimes the best thing you can do. Studies show putting your energy into the process of achievement is better than focusing solely on the goal. With weight loss, for example, simply exercising regularly and watching calories is better than becoming obsessed with a number that you want to lose. By disengaging from goals that we are finding difficult to achieve we reduce our stress, which allows us to sleep better, as well as having fewer illnesses like headaches and constipation. Tunnel-vision can be good to keep you focused but it can also mean that you miss out on opportunities that could be passing under your nose. Ivy League graduates who changed position more than once every three years were found to be nine times likelier to be hold a more senior position than peers who didn’t. The “do whatever it takes” attitude that many people laud as necessary to achieve success can also mean changing your opinions of behaviour is acceptable. Once you have made this ethical compromise it can be difficult to go back. So, it would seem that knowing when to cut and run and quit a project or path can be a very useful skill. Don’t be afraid to listen to yourself and the scientific evidence. Striving to achieve what you want is laudable, but being able to acknowledge that it’s not going to happen can be just as important.